This bridal party photograph sums up the whole wedding day for Erika and Mark. They are such a fun and energetic bunch to work with. It's a huge party. A lot of personalities. And a lot of stories to tell. Erika with her bridesmaids started getting ready at 7am which was the earliest bridal prep I have ever been to. It was a long day as they were at least half an hour late to the ceremony (almost like an hour I remember haha). As a result, just like every wedding nothing goes as planned on the wedding day, but that's the reason why weddings are fun, unpredictable, and full of surprises. Regardless, nothing has stopped them from enjoying the big day. This picture is actually a series of images. I told the wedding party that I'm going to keep counting on 3, and everybody has to strike a pose. In a matter of a minute they were just having so much fun. As you can tell the bride and groom just busted out laughing and couldn't stop it. And everybody showcased their best poses. Not to mention the Space Needle in the background just makes everything even more perfect! 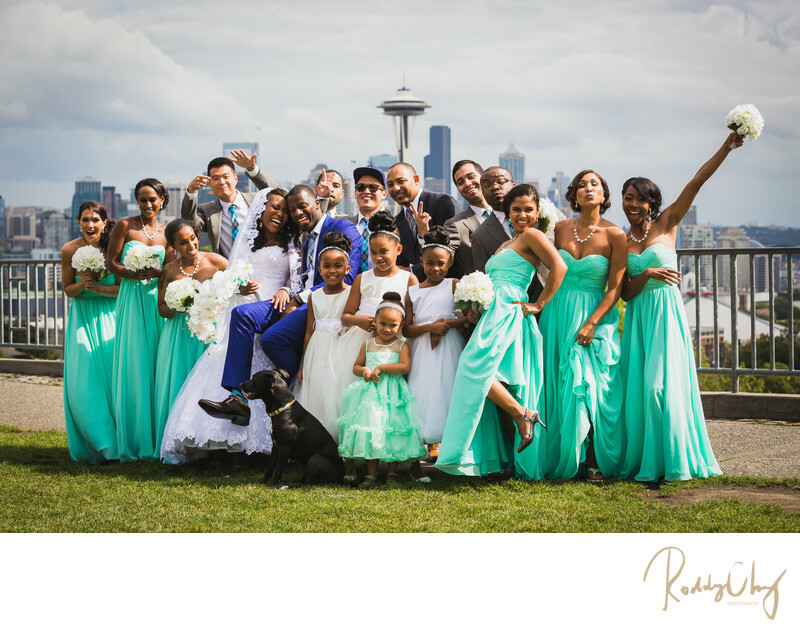 Definitely an iconic bridal party photograph in the most iconic spot in Seattle. Location: 211 W Highland Dr, Seattle, WA 98119. Keywords: black (3), kerry park (3), space needle (3), wedding party (12).